Monday April 21st 1902 It was warmer with a high wind. I had a little boy to help me churn and wash. I did not do much of any thing in the afternoon. Some mending and read a little. Tuesday April 22nd 1902 Will hitched to my new buggy this morning and I went down for Mother. We went to town, the wind was pretty strong. There was a shower at noon. I took Mother home at four oclock and went to the dentists. When I came home the wind was terrible. 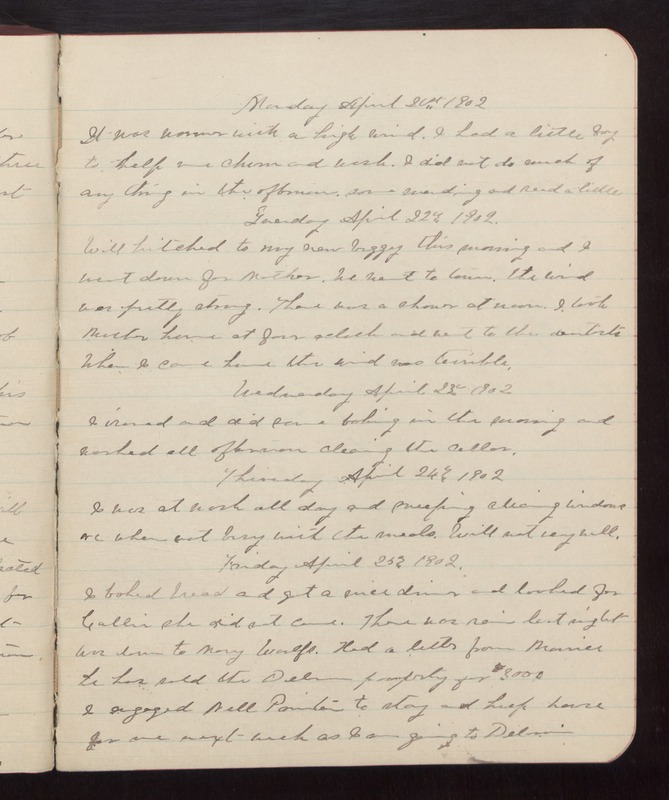 Wednesday April 23rd 1902 I ironed and did some baking in the morning and worked all afternoon cleaning the cellar. Thursday April 24th 1902 I was at work all day and sweeping, cleaning windows and when not busy with the meals. Will not very well. Friday April 25th 1902 I baked bread and got a nice dinner and looked for Callie she did not come. There was rain last night was down to Mary Woolfs, Had a letter from [Maurice?] he has sold the Delavan property for $3000. I engaged Nell Pointer to stay and keep house for me next week as I am going to Delavan.